Amador County Continued... One of these home winemakers, Charlie Myers, is credited by many as being the catalyst that brought fine winemaking back to the foothills. Charlie had a friend by the name of Darrell Corti, well known in the Sacramento area for his gourmet food and wine stores. When Charlie shared his 1965 vintage Zinfandel with Corti, Corti in turn shared it with Bob Trinchero whose family owned Sutter Home Winery in the Napa Valley. Trinchero was impressed enough that he made a trip up to the Shenandoah Valley area of Amador County and purchased 20 tons of grapes from Deaver vineyards. Sutter Home was never the same. This was the beginning of the era of big bold, some say monster, Zins that turned the California wine industry on its ear. The rush was now on by many larger wineries and new, aspiring winemakers, to find the old vines that still remained in the area and the re-emergence of this as a fine winemaking region. 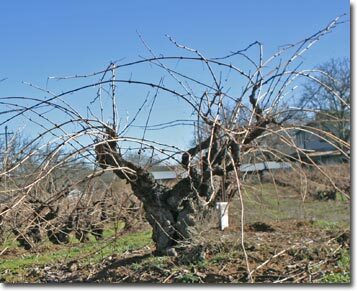 There are at least five old vine Zin vineyards still in production that are can be dated to pre-Prohibition, many own rooted and still dry farmed. They are located at the Jim Fox’s Fox Creek Vineyard, Deaver Vineyards, Eschen Vineyard, Sadie Upton Vineyard and the Grandpere Vineyard. 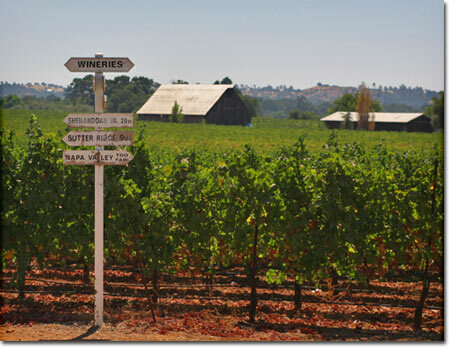 The Grandpere is owned by Terri Harvey and is thought to have the oldest Zin vines in Amador County. Another vineyard of significant merit is the John J. Davis Vineyard at the Deaver Estate. These vineyards can be dated to the late 1860’s and also include 6 acres of Mission grapes that may be the oldest remaining Mission vines in the state. The grapes from all of these vineyards are highly sought out by many Zin producers throughout California for their ability to add complexity and spice to a wine. The first new winery to open its doors in Amador was Montevina, founded by Cary and Vicki Gott and W.H. Field in 1973. The estate came with 60 acres of Zins that could be dated to the early 1900s and the family continued to plant Zinfandel as well as Nebbiolo and Barbera. The winery was later sold to the Sutter Home Trinchero family in 1988 and 75 acres of Zin vines went to Jim Fox, mentioned above. Many wineries have followed since the opening of that first new winery. In 1977 Leon Sobon purchased 77 acres of Shenandoah countryside and started Shenandoah Vineyards. He and his wife Shirley purchased the D’Agostini Winery in 1989 and renamed it Sobon. Today this state historic site is also the site of a tasting room and Gold Country agriculture museum. This area of the Sierra Nevada Foothills sits between the 1200 and 2000 foot elevations and is blessed with warm sunny days and cool nights. And although hot during the long days of summer, it seldom gets past 100 degrees before the breezes off the mountains in the evening bring them back down into the 60s or lower. Combining that with the primarily dense decomposed granitic soils allowed the vintners of Amador to expand the vineyards very effectively to include many Italian varietals as well as many found primarily in the French Rhone. So, pack up the car and take a ride up either Highways 16 or 88 through the rolling pasturelands that lead to this incredibly beautiful wine region. Make sure to give yourself enough time to take in the local hospitality that is exceptional as the wine. This is a wine country that can’t be missed. And remember to tell them Sierra Wines sent you!